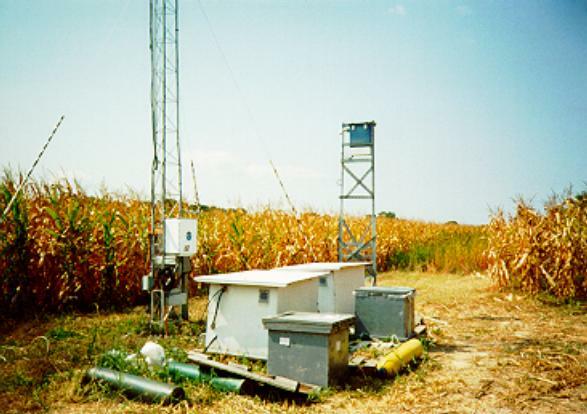 I set up a remote site on the Eastern Shore of the Chesapeake Bay, where instruments monitor ozone, carbon monoxide, sulphur dioxide, carbon dioxide, total ultraviolet light, and NO y (total reactive oxides of nitrogen). I examined correlations of NOy with CO and SO2 to determine the relative importance of different reactive nitrogen sources. Positive correlations of NOy with SO 2 indicate coal combustion sources, while positive correlations with CO point to mobile sources such as automobiles. In addition, I have used a back trajectory model (HYSPLIT) to determine the origins of the air parcels carrying these gases. In 1999, I spent seven weeks in the Indian Ocean measuring trace gases and aerosols for the INDOEX project. See here for pictures, ship tracks, and some graphs. We found that ozone is transported over the Indian Ocean, with the Indian subcontinent as the primary source, instead of downward mixing, as had been previously suggested, and also that ozone destruction may be occurring at a faster rate than can be explained by conventional HOx chemistry alone. CO is also advected away from the continents, and serves as a tracer for anthropogenic pollution, indicating, for example, that the ITCZ serves as a barrier to mixing between air from the Northern Hemisphere and Southern Hemisphere. Also in 1999, I flew temperature, relative humidity, pressure altitude, SO2, O3 , CO on board a small airplane (single-engine Cessna 172 or twin engine Piper Aztec, depending on the flight) in Philadelphia, PA for the NE-OPS (Northeast Oxidant Particle Study) project. The impact of local ozone production as well as transport became quite clear as we observed upwind profiles with uniform, elevated ozone levels and downwind profiles with high ozone in the boundary layer. One day in particular showed the importance of local circulation and small-scale effects in determining ground-level air quality, as a strong sea breeze blew all the way from the New Jersey coast, inland and past Philadelphia. The air at the surface was clean air from over the Atlantic Ocean, while the air only a couple hundred meters above was clearly the same polluted air that had been present over the city all day. When the front of the breeze blew in, winds shifted suddenly by 90 degrees, and ozone and CO levels both dropped dramatically at the surface. I am running the EPA Models-3/CMAQ air quality model, doing some local air quality modeling. Our aims were to determine the impact of Ohio River Valley sources on Maryland air quality, and to get some idea of the relative importance of local and regional sources of air pollution. The goals of this program are, to some extent, wide open, though we plan to do numerous sensitivity tests, and possibly do some ensemble-style runs of CMAQ for air quality planning purposes. We finished the January/February 2002 for the OTR's SIP modeling. Our analysis of CMAQ's predictions and a comparison with observations suggested that Maryland's air quality might be considerably better than predicted! In 2009, that was the case, but only time will tell if we were right. I have also written a conceptual model of Mid-Atlantic air quality in conjunction with MARAMA. We have recently measured aerosols and air pollution from an aircraft and from surface sites in China as part of the EAST-AIRE project. NASA and NSF teamed up with the Chinese government to support this project. The conclusion is that China suffers from local, transported, and natural air quality problems. Dust storms are a frequent menace, but the dust also comes covered with a modern industrial coating of soot and sulfur. The people of China already know this: in Shenyang, they wear masks all winter long, and discard them at the end of the day. We are also working on the radiative properties of coated soot particles. Conceptually, imagine how a sidewalk appears much darker when it's wet. The same (not completely for the same reasons) holds true for aerosol particles that have been "wetted" with a sulfate/water coating. They appear darker, sootier, and more absorbing. The impacts on climate change and photochemistry are potentially enormous. Several earlier authors pioneered this reasearch, and we are now pushing it into the lab to see how well these ideas hold up when used to examine aerosols with known size and composition. I am a busy pup this year! I am also working on ruggedizing an ammonia detector for use in estimating ammonia emissions. We are working with Dr. Melody Avery of NASA/Langley on the experiment design. We have not had a wave of volunteers for this duty, however, since it involves sitting in the plume of a hog barn on hot summer days. Wonder why? The experiment will be an intriguing one, since the swine production facility is a USDA experiment station, so we will know exactly what those hogs are eating! I am the director of the Maryland aircraft research program. On most polluted days in summer, we fly our aircraft upwind and downwind of the Baltimore-Washington, D.C. metropolitan areas to investigate air pollution. The data are then used to evaluate models, improve and evaluate satellite retrievals, and look for trends in air quality data. We also use the data on an episodic basis to examine the nature of particular air quality events. Look for us in the skies next time you hear it's a code orange air quality day! I am working with Marcos Andrade, a recent graduate of the department, who has recently moved to Bolivia. Marcos and I are looking into measuring some trace gases at Bolivian air quality sites, and collaborating on the low level jet over the Bolivian part of the Amazon. I direct field operations for the National Acid Deposition Program's MD99, Beltsville, Maryland site. I am working with several colleagues at EPA and NASA on nitrogen deposition to the Gulf of Mexico and its watershed. This project involves evaluations of precipitation from a metorological model, evaulating the nitrogen deposition from an air quality model, and putting the results of those models into a water quality model. The water quality model then predicts nutrient flow down the Mississippi and into the Gulf itself. We aim to improve the simulation by evaluation with satellite data and by adding lightning NOx emissions to the model. On the side, I also do some consulting on patents, forensic meteorology, air pollution and the like, and I perform improvisational comedy around town. 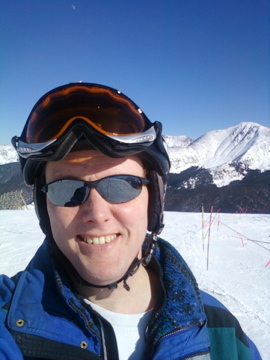 Future interests include: development of a cloud sensor for radiosondes; and measurement of SO2 and sulfate over the East Coast via satellite, airplane, and at the surface. Bruce Doddridge, now at NASA Langley. As I am a research scientist, my teaching responsibilities are normally restricted to picking up the occasional class for higher-ups in the group. I developed a class, Honors 238-O, on African air pollution, which uses the arena of African air pollution to develop scientific communication skills, and was very well received. I have taught AOSC 200, Introduction to Meteorology, with Charles Piety. I have helped Russ Dickerson teach AOSC 634, Air Sampling and Analysis and AOSC 637, Atmospheric Chemistry and have filled in lectures for Bruce Doddridge and Alex DeCaria in AOSC 434, Air Pollution . I do have a great interest in teaching, and participated in the TOPDS program at the University of Minnesota, which (in part) puts terrified graduate students in front of real lecture rooms and lets them present a lecture. It's a remarkable program, and I had a lot of fun doing it. Click here for my teaching portfolio . For full list of publications, click here. An old picture of my field site at the University of Maryland Wye Research and Education Center . Click here for more pictures of the site. My research (meaning "me") is supported by the Maryland Department of the Environment, the Maryland Department of Natural Resources and NASA. I like hiking, biking, rock climbing, and most anything else that will get me outside where I can see mountains. When forced indoors, I read books, hang out with friends, and watch a little too much sports on TV. Married? Yes! Click here for fun pictures and other things. Click here to see my new (to me, still) house! Click here for me being a goofball. This home page last updated March 5, 2010. Brought to you by the letters Q and M, and the number 3 .